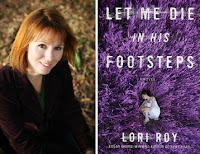 Today I welcome Lori Roy. Lori is the author of the Best First Novel Edgar Award for Bent Road. It was also named a New York Times Notable Crime Book, and named a 2012 notable book by the state of Kansas. Her second mystery, Until She Comes Home, was a finalist for the Edgar Award for Best Novel. Her third novel, Let Me Die in His Footsteps, launches today! Lori Roy lives with her family in west central Florida. It’s August 12th, 2014, midmorning on a Tuesday. Here in Florida, I have my most recent novel up on my computer screen. Denise Roy, Dutton Senior Editor, has the same pulled up in her New York office. Looking for phrases that might inspire a title, we’re paging through the text together. Some of our ideas are too familiar. Others, too forgettable. Yet others have been used too recently or too frequently. Today is the day we must, absolutely must, decide on a title for my third novel. Our deadline is noon. Titles are tricky business. Many theories exist as to what makes a good title. There’s even a website that will quantify a title’s chances of becoming a bestseller. As to my own theory, I’m searching for those perfect few words that will intrigue a reader as her eyes scan the bookshelves of her favorite bookstore, and that will further offer insight once she has read the book. By late morning, I have filled a page in my spiral notebook with ideas. Denise and I decide to hang up and work separately to see what new possibilities we might shake loose. I stare down on my list and let out a sigh. A few are of the titles are intriguing but not necessarily insightful. I would call them trite. Others are insightful but not intriguing. These, I would call befuddling. I continue scanning the manuscript for the one perfect phrase that will capture the heart of my 95.000 word novel, and approximately 45 minutes before our deadline, I receive an email from Denise. While googling a phrase from the book, she stumbled upon a Bob Dylan song titled LET ME DIE IN MY FOOTSTEPS. What do you think of this direction, she asks. I click on the link Denise has included in her email and listen to the song. I google the lyrics and read along as I listen yet again. I go so far as to sing along. The noon deadline is nearly upon us. I email Denise back to tell her I like this direction. I like it a lot. And as I wait to hear if the new title has been accepted, I do some research. The song was written during the Vietnam War Era, and there are various theories as to its intended meaning. While I won’t speculate as to Mr. Dylan’s intentions, I hear a song that cautions against allowing the weight of fear or judgment to put us in a figurative grave long before we are put in a literal grave. At the heart of my third novel, which we are trying desperately to title, is a community that allows itself to be guided by such fear. The people of the small, fictional town choose to sacrifice another in order to ease their own fears and recapture hope for better times. The consequences of their actions are disastrous and deadly. Alternatively, there is one character in the novel who doesn’t succumb to fear and demonstrates the courage to seek a better life. While this character does not appear often in the novel, he is among the most significant. Given his important role, Denise and I decide to make a slight change to Mr. Dylan’s title—choosing to use ‘his footsteps’ instead of ‘my footsteps.’ Intriguing and insightful. It meets both of my tests. A few days later, I see a tweet that references this new title. Yes, Denise confirms, it’s official. The title of my third novel, out today, June 2, 2015 is LET ME DIE IN HIS FOOTSTEPS.